As promised in my earlier post there’s a host of book reviews coming up on the blog. 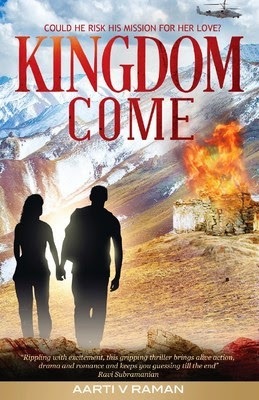 Today I am reviewing a super thriller called Kingdome Come by Indian author Aarti V. Raman. I read a thriller after a long break from thrillers. I was reading a lot of romance. And I was so happy when I got my hands on this book. I had a lot of backlog on reading up so I am reviewing this one little late. I finished up two books like some super book worm. Okay now let’s get to our Kingdome Come. Krivi Iyer, the former spy and a bomb diffusal expert is coming to terms with a deep loss in his life. His only aim left in life is to get hold of The Woodpecker, the mentally unstable bomber who is the reason of Krivi’s loss. With a call from his discreet partner Krivi gets to know his only change to get closer to The Woodpecker is through his alleged sister, Ziya Marten. From groing up in foster homes to getting a high profile degree Ziya had moved in leaps and is the manager at Goonj Enterprises in Srinagar, Kashmir, incidentally, Krivi joins Goonj undercover. When tragedy hits Ziya, she finds herself more dependent on Krivi and learns about his tormented past. Will Krivi be successful in getting The Woodpecker? Can Krivi and Ziya come together? You gotta read Kingdom Come for the answers. The first time I started reading the book I got completely taken by the narrative. I like how the author opens up with a nail biting kidnapping sequence, and how Krivi saves a sixteen year old victim. It was quite a ‘Hurtlocker’ sort of experience. I like it when authors throw action, thrill and mystery in the beginning. It only helps to get the reader going. Kingdome Come is exciting, thrilling and exhilarating from the word go. The characters are extremely well etched and descriptions are superlative. You can visualize things infront of your eyes as you go on reading. I loved the foreword that Aarti has written. She states Akshay Kumar is the inspiration of the character, and I can totally understand why. You somehow believe it’s probably written for him. I won’t be surprised if I see this on celluloid some time. Though I don’t know how far Akshay will do this role (given the kind of roles he has been doing lately – read Boss, Khiladi 786 etc.. ohh Holiday is an exception). Indian author Aarti V Raman, has many novels to her credit which includes White Knight, a short story in the Atlas of Love. On GoodReads I read she always wanted to become a lawyer but she decided to become an author. I am so glad she went with her heart, because when you write a thriller like that that, you deserved all praises. And she is just 27! I am actually quite overwhelmed with it and you will get to know that below with the rating! This book was sent by the publisher. These are entirely my own views and I try not to be biased while reviewing.